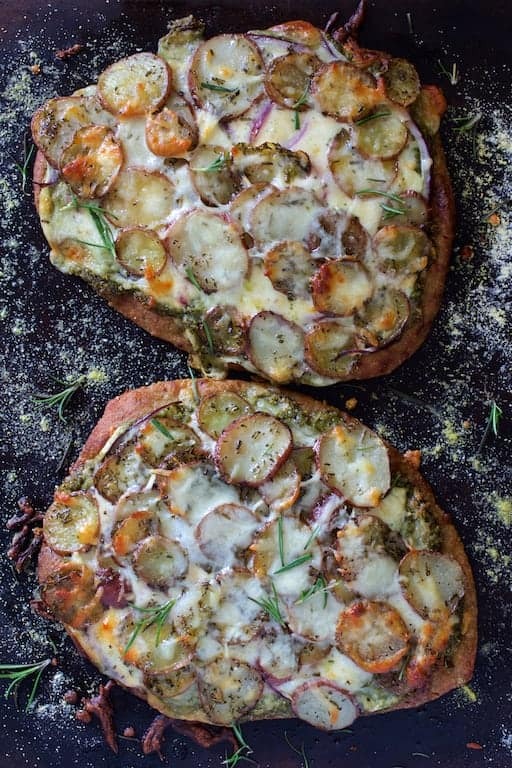 Naan Potato Pizza with Radish Top Pesto and Smoked Mozzarella, baby! Perfect for carb-lovers! Radish season is fast approaching. Save the tops to make a delicious pesto … and then make this pizza! This is a recipe I’ve been meaning to bring to you for a very LONG time. However, with everything else going on around here, making pizza dough just seemed like too much work! My stepchildren and I had a difficult time bonding when my husband and I first got married. Yeah, a stepmom isn’t exactly every child’s dream. However, one of the things we started doing to have some fun and just relax as a blended family was “Make Your Own Pizza” night. We would get all the fixings together and then use flatbread, pitas or naans for the crust so everyone could create their own personal pizzas. Who can’t forget their troubles over pizza? To this day, MYOP nights are special to all of us. So, now when my mom-in-law is heading back after her month-long visit, we all get together the night before she leaves and do a MYOP night. We all have a great time! Thanks to that recent MYOP night, I remembered we had several packages of naan in the freezer. It’s so perfect as a quickie pizza crust! 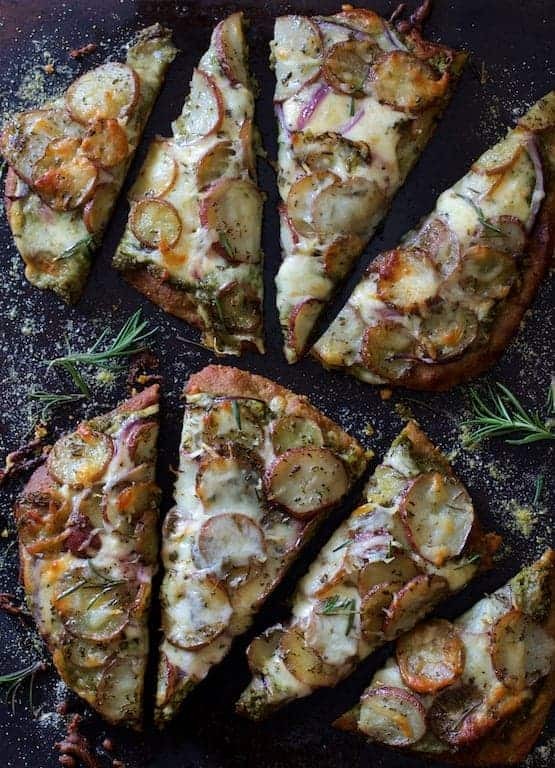 Here’s all you do for this naan potato pizza…. 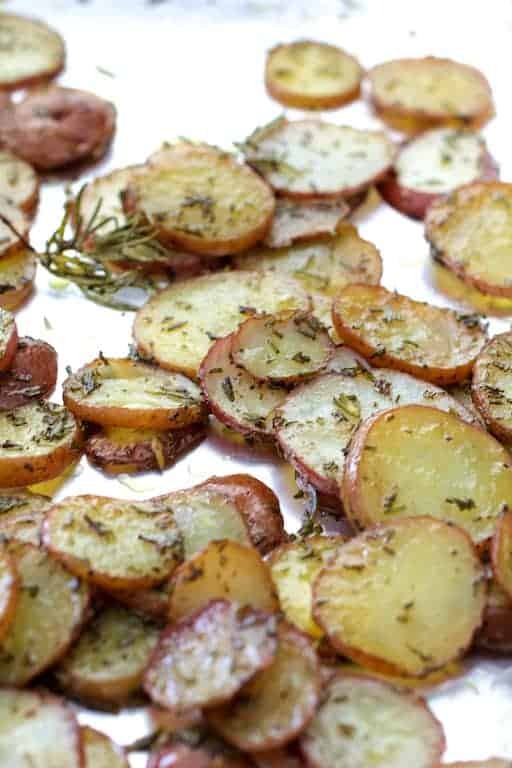 Roast potato slices in extra-virgin olive oil, salt and pepper and plenty of fresh rosemary until they’re tender but not browned or potato chip-like. Spread pesto over the naan. I used Radish Greens Pesto we had in our freezer. Radish season is coming up quickly so be sure to make some! It’s perfect here! Not so sure basil pesto would work as basil and rosemary don’t sound like a great combination. Just sayin…. However, you could use kale or spinach pesto. 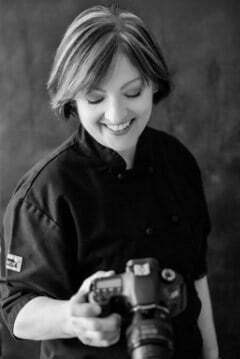 Top with smoked Mozzarella (or smoked Provolone or smoked Gouda), red onion slices, the taters, a bit more cheese and…. Top this naan potato pizza with an over-easy egg and I’m thinking a crazy delicious breakfast! Here's a pizza for the carb-lover! Add an over-easy egg and you have a crazy delicious breakfast! Preheat oven to 375 degrees. Line a baking sheet with nonstick aluminum foil. 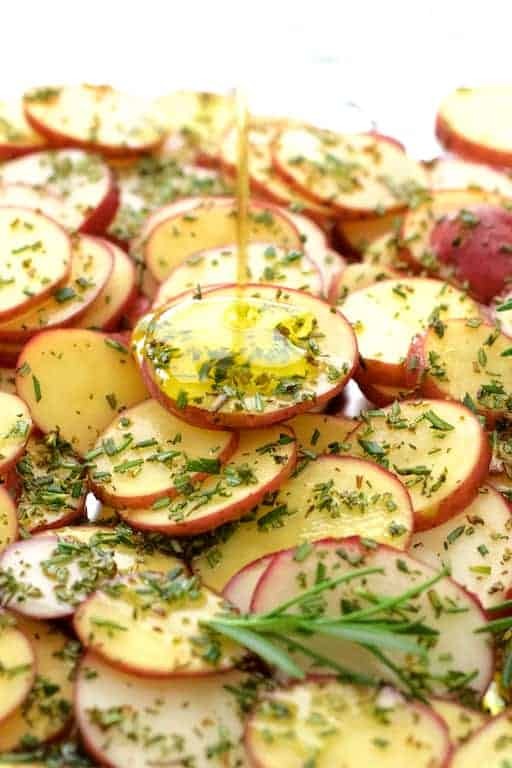 Toss potatoes with olive oil, salt, black pepper and rosemary. Spread out on the baking sheet and roast for 15-20 minutes or until tender but not browned. Spread pesto over naans. Top with 3/4 of the cheese, reserving some for on top. 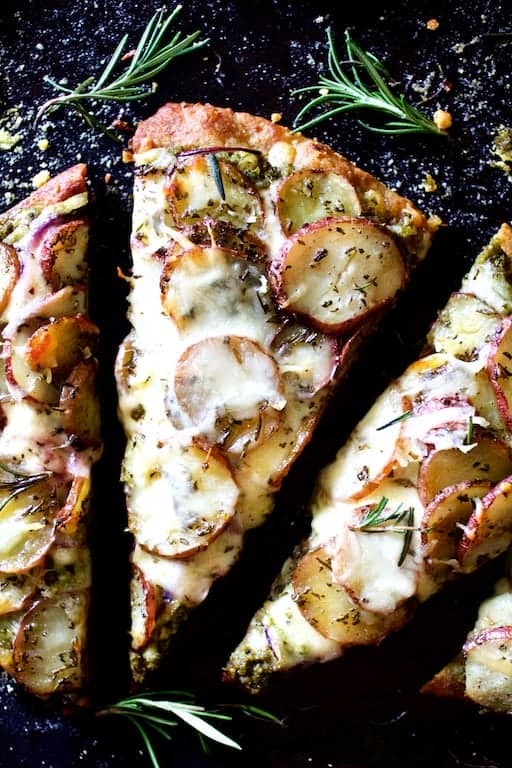 Place red onion slices on pizza, followed by potatoes and remaining cheese. 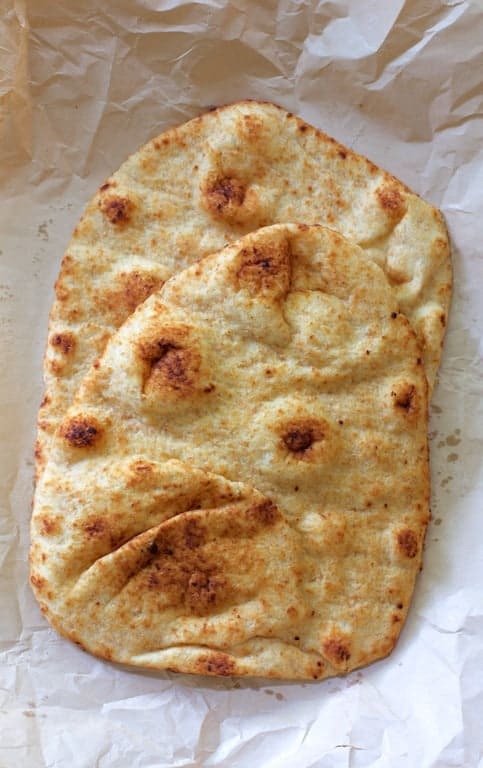 Bake 15-20 minutes on a pizza stone (if possible) or until naan is crispy and cheese is melted and lightly browned. Cut into slices and serve immediately. Oh my… I need this! And the egg is non-negotiable in my opinion! This sounds incredible! 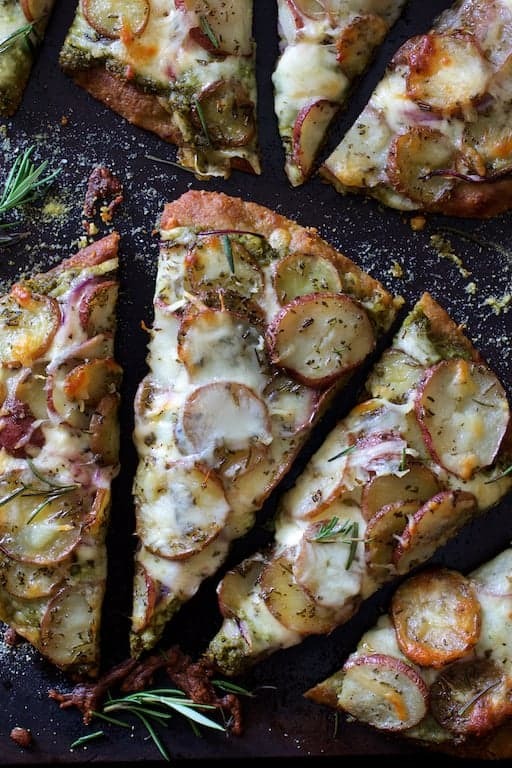 I love potatoes on pizza and have recently been popping radish tops into everything I cook! Yum! Thanks, Abra! 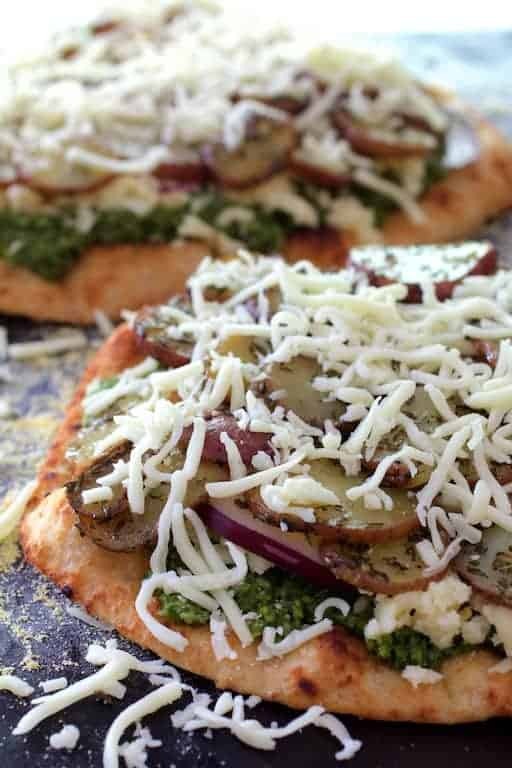 They really are awesome on pizza and the radish top pesto adds just the right kind of zing! Hope you enjoy!